A smoothie in a bowl topped with fruit and coconut flakes. Sounds delicious?! The smoothie bowl is thicker in consistency than a smoothie. That’s why you eat it with a spoon. Really easy and fast to make and a great way to sneak in some extra veggies. 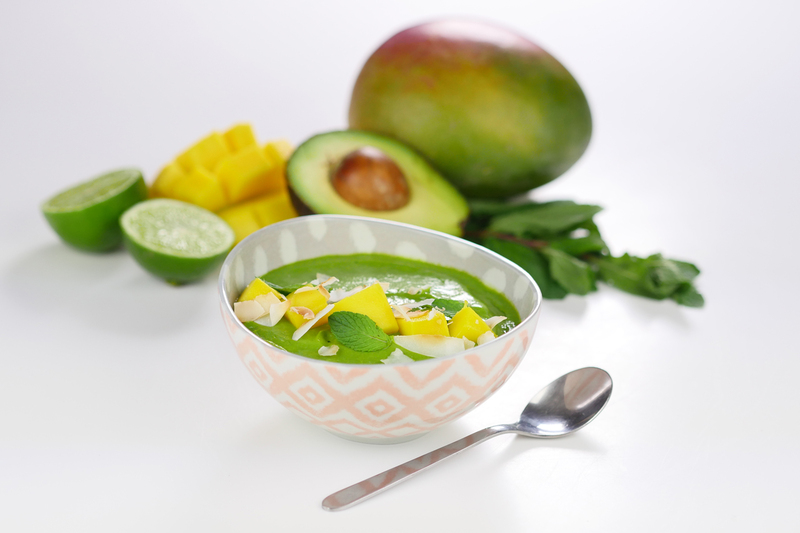 This green version with mango, avocado and spinach is fresh, sweet, deliciously creamy and a guaranteed eye candy! Peel and cut the mango and avocado into pieces and add to the blender with all other ingredients (Set some mango pieces aside for decoration). Add the water (100 ml) and blend until a creamy mousse has formed. Fill into 1 or 2 bowls and decorate with mango pieces and coconut flakes.